A common area phone (CAP) is typically placed in an area like a lobby or another area that is available to a lot of people. For example, a reception area phone, door phone or meeting room phone, CAPs are set up as devices rather than users and automatically sign into a network. In the steps below, we’ll help you set up an account for Phone System with Calling Plans so you can deploy these types of phones for your organization. Purchase Common Area Phone license and a Calling Plan. Search for and buy approved phones (view the list here). Polycom VVX phones: Go to Settings > Status > Platform > Application > Main. Yealink phones: Go to Status on the main phone screen. AudioCodes phones: Go to Menu > Device Status > Firmware version from the start screen. Lync Phone Edition (LPE) phones: Go to Menu > System Information from the start screen. Firmware updates are managed by the Skype for Business Service. Every Skype for Business certified phone's firmware is uploaded to the Skype for Business Update server, and device update is enabled on all phones by default. Depending on the inactivity time on the phone and polling intervals, phones will automatically download and install the latest certified builds. You can disable the device update settings by using the Set-CsIPPhonePolicy cmdlet and setting the EnableDeviceUpdate parameter to false. In the Office 365 admin center, go to Billing > Purchase services, and add Other plans. Click on Common Area Phone > Buy now > on the Checkout page click on Buy now. Click on to expand Add-on subscriptions and then click on to buy a Calling Plan. Choose either the Domestic Calling Plan or Domestic and International Calling Plan. You don't need a Phone System license. It's included with the Common Area Phone license. 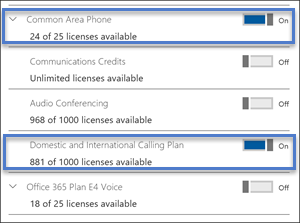 For more info on licenses, see Skype for Business and Microsoft Teams add-on licensing. In the Office 365 admin center, go to Users > Active Users > Add a user. Put in a User name like “Main" for the first name and "Reception” for the second name. Put in a Display name if it doesn't autogenerate one like "Main Reception". Put in a User name like "MainReception" or "Mainlobby". For common area phones, you might want to set a password manually or have the same password for all of you common area phones. Also, you might think about unselecting Make this user change their password when they first sign in. Then you need to pick either a Domestic Calling Plan or a Domestic and International Calling Plan. 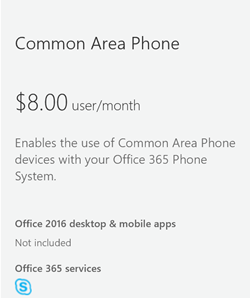 Just so you know, Skype for Business Plan 2 is included with the Common Area Phone license. For more details, see Add a user. In the Office 365 admin center > Admin centers > Skype for Business. In the Skype for Business admin center > Voice > Phone numbers. Select a number from the list of phone numbers and click Assign. On the Assign page, in the Voice user box enter the name of the user that is used for the phone then select the user in the Select a voice user drop down. While you're there you will need to add an emergency address. Once you search, look under the Select emergency address to pick the right one for you. Users will only show up if they have a Phone System licence applied. If you just did this, then sometimes it takes a bit for the user to show up in the list. For more stuff, see Getting phone numbers for your users. If you're wondering, you can also take your phone number that you have with another carrier and "port" or transfer them over to Office 365. 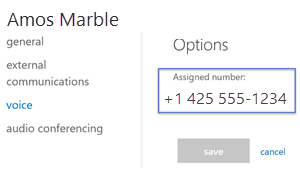 See, Transfer phone numbers to Office 365. The phone or phones you have must have the Common Area Phone mode turned on. You might want to check on that to make sure they do. In your browser, connect to the web interface so that you can enable CAP mode. Then go to Setting and in the Skype for Business Setting option, select Common Area Phone. Click Yes to save your settings. In Administration settings, select Common Area Phone Settings. Enable CAP and CAP Admin Mode. Ok, now your phone is ready so you can sign in on the home screen. Sign in by selecting Settings > Features > Skype for Business. Select User Credentials, and select web sign-in (CAP) to generate a code. Go to the provisioning portal, and sign in as admin. Enter the display name (for example, Main Reception). If Search for Common Area Phones only is checked, clear the checkbox and search again. In the pairing code window, enter the code displayed on the phone and click Provision. Following this last step, the phone should sign in automatically. The CAP provisioning site states it will reset the CAP account's password to a random password. Take note that the account the CAP is referring is the Azure Active Directory (AAD) account. If you created the account in AAD only then the process is straightforward. If you have synced an on premises Active Directory to AAD and you use a third-party IDP or ADFS, CAP provisioning will fail. In this case, you need to use an Office 365/Azure Active Directory account only (for example, an account with onmicrosoft.com domain) for CAP provisioning to work. Learn more about available phones at Deploying Skype for Business Online phones.